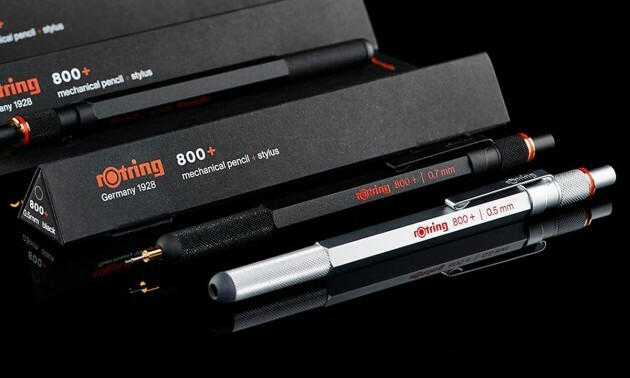 rOtring has recently unveiled its new 800 that comes with a “+”. And this might be the most ingenious way to incorporate a rubber-thingy for tactile screens. The point of the mechanical pencil goes THROUGH the rubber. I find this as being not as goofy as most of the rubber-thingy on the top of the cap or the back of the pencil. This is just so elegant. Clever! Can you compare the inner mechanism of this 800 with a vintage 800, i. e. with one made before Newell-Rubbermaid had bought Rotring? I have no vintage 800, and have only preordered the “+”. So I have no means to compare the two. Sorry.